Polestar's printing site in Sheffield, UK, produces around 2.5 million high-quality catalogues, magazines, brochures and supplements every 24 hours. Polestar is Europe's largest independent printing company and is predicted to save more than £10,000 off the annual energy bill at its Sheffield printing plant by adopting a new VSD-driven vacuum pump from Atlas Copco. When Polestar was confronted with the need to make major repairs to one of its three existing fixed speed vacuum pumps at its £100 million purpose-built Sheffield Gravure plant, a production site that has received environmental awards for its green credentials, the company re-assessed its combined operation to establish the potential savings that could be made by installing a more energy-efficient replacement. Recognising the clear synergies between compressed air and vacuum in the field of air movement, it was a logical move by Polestar Sheffield to seek the recommendations of Halifax-based Pennine Pneumatic Services (PPS) for the optimum solution to their vacuum needs. Atlas Copco Compressors’ premier distributor in Yorkshire, PPS has been a long term supplier of compressed air systems, both fixed speed and VSD-driven, pipework and maintenance services to the company. As a result, a GHS900 VSD+, one of Atlas Copco's new generation of intelligent, oil-sealed, plug-and-play rotary screw vacuum pumps, was installed on a trial basis to show how it could deliver peak performance at the required operating pressure, and help achieve substantial energy savings. 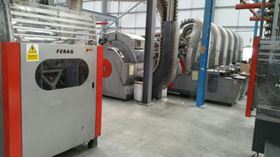 Of the three existing units, the two smaller fixed speed vacuum pumps previously used by Polestar Sheffield were running at approximately 20 kW an hour (one rated at 11 kW and the other at 9.7kW combined). The single GHS VSD+ vacuum pump that replaced them is a 15 kW unit, which operates at approximately 20% load, equating to just 4 kW. Based on an operation of 8,000 hours per annum, the estimated savings are expected to exceed £10,000 (16 KW × £0.08 × 8,000 hours). Ensuring reliability and harnessing advanced technology are key to Polestar Sheffield's success, which has led to the site winning the prestigious ERA (European Rotogravure Association) printing award. While the gravure process is traditionally employed for long print runs, the latest engraving technology allows for short-run work with significant paper usage savings. Polestar's elite printing site produces around 2.5 million high-quality catalogues, magazines, brochures and supplements every 24 hours. These include many of the top consumer magazines including weekly TV listing titles and national newspaper supplements. Printing production line at Polestar, Sheffield, UK. A vacuum system plays an essential role within the transfer of work from the presses to the print finishing and bindery operations. In addition to its modern rotary gravure printing facilities, Polestar's £34 million investment has included a purpose-built web offset 96- and 64-page size press installation together with multiple stitching stations. The GHS 350-900VSD+ rotary screw vacuum pump range is an advance in rough vacuum technology that is based on Atlas Copco's advanced screw compressor principles. The GHS VSD+ range offers benefits to manufacturers. According to the manufacturers, these include average energy savings of 50% compared to conventional oil-sealed and dry vane pumps, as well as best-in-class noise levels and oil retention properties. Primarily, its VSD technology enables users to precisely adapt their vacuum generation requirements to match the demands of their production processes. With approximately three quarters of all UK companies that employ rough vacuum requiring oil injected pumps, which are traditionally fixed speed, there is massive potential for energy savings derived from the new VSD technology to be gained across many sectors of UK manufacturing industry. The Atlas Copco GHS VSD+ vacuum pump system plays an essential role within the transfer of work from the presses to the print finishing and bindery operations. The GHS 350-900 VSD+ range, generates a nominal displacement of up to 900 m3/h, incorporates VSD technology that enables users to adapt their vacuum generation requirements to match the demands of their process. The GHS VSD+ vacuum pump only delivers energy and performance when and where it is needed. If demand drops to half it only delivers half, and the power consumed is halved. The GHS VSD+ range is designed to aid a range of manufacturing industries, such as food and meat processing, bottling, canning, plastics, packaging, printing, paper, electronics, woodworking, house vacuum and central systems. Typical applications include lifting and handling, forming and shaping, vacuum packing, preservation, freeze drying, pick and place and pneumatic conveying. The range offers energy recovery features on the larger models, which leads to minimal hot air carry-over in the workplace and air-conditioned production environments.